Maclin Truck & Trailer is pleased to be your go-to service provider for truck and trailer problems out on the road. Our specialty is roadside repair and maintenance for commercial tractor trailers, large commercial trucks and RVs. In need of a more comprehensive repair? Get a tow to our shop for reliable service at a great price. For trucks and other fifth-wheel vehicles that spend a lot of time on the road, problems can arise at any time. Road debris can cause blowouts, batteries can die, radiators can overheat and a slew of other issues have the potential to sideline your vehicle. When these issues erupt without warning, make sure you’re calling Maclin Truck & Trailer for mobile semi truck repair in Flagstaff, AZ. We work to arrive quickly and administer repairs that get you back on the road fast. Our mission is to minimize downtime for truckers, while providing a level of service that ensures your safety and peace of mind out on the road. 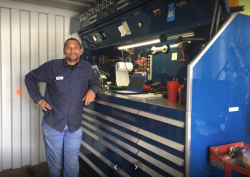 Our team is adept in all facets of mobile semi truck servicing in Flagstaff, AZ, from undercarriage work to basic maintenance items like brakes, tires and wheels. We also specialize in electrical and mechanical repair services, including refrigeration repairs and engine work. Our team works on all types of diesel engines and is quick to identify problems that may be affecting your truck’s performance. And, if the repair is too great to be undertaken on the side of the road, we have a fully-equipped shop and towing capabilities. We’re proud to be the clear and present choice for semi truck repair in Flagstaff, AZ, and we’ll prove it to you the next time you’re stuck on the side of the road! We take calls and offer mobile repair within 100 miles of our location in Flagstaff, AZ. Ask us about towing to our shop and receive a great deal on the towing cost! We specialize in commercial engine repair for Volvo, Caterpillar, Cummins, International and Detroit. Our roadside capabilities span the gamut to ensure your truck and trailer are roadworthy and safe. Flat tire? Dead battery? Blowout? Whatever’s got you on the side of the road, we’re ready to fix it. Contact us right away for roadside repair and servicing, or to set up an in-shop appointment.